A recent study by the National Low Income Housing Coalition finds that for every 10 Maine families seeking affordable rental housing, there are fewer than 6 units available. Many of these households spend more than half of their incomes on housing and utilities. They may qualify for housing assistance such as Section 8, but there's often at least a three-year wait. And there are other barriers that can get in the way of help. This is the fourth part in a series called "Eviction: Life Unpacked." 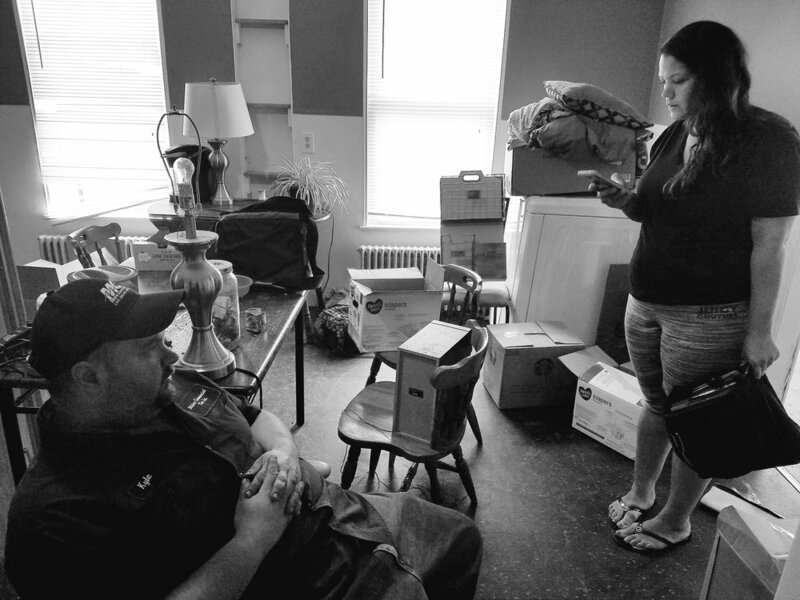 It's late June, and Joy is packing up her family's belongings as her boyfriend carries furniture and other items out to a borrowed truck. He's taking it all to a rented storage unit. Joy and her three kids are being evicted from their Lewiston apartment, where they've lived for the past year. Several neighbors have dropped by. Joy, whose real name has been changed to protect her privacy, is feeling stressed. "Oh my goodness, I'm getting way too overwhelmed right now," she says. Joy says her eviction troubles started several months earlier, when she and her boyfriend Kyle broke up. He was the primary breadwinner, and when he moved out, Joy fell behind in the rent. She owes the landlord nearly $2,500. The couple are living apart but trying to work things out. She has no car, and her driver's license is suspended for failing to pay a fine. That has made finding a job more challenging. It has also made apartment hunting harder, along with moving out. Her two older kids, ages 14 and 11, are visiting her ex. The youngest, Tori, has gathered up her library books and some toys. "I'm going to be six tomorrow," she says. "I'm getting a hamster." "When we get a new place we're gonna get a hamster," Joy says. That may not be for a while. The family has qualified for nearly $800 a month in general assistance from the state, but there isn't anything Joy can find to fit that budget. And there are no three-bedroom apartments available. So, instead, Tori will spend her sixth birthday becoming homeless. It's the second time in four years. "I told myself it was the last time it was gonna happen, and I just feel bad for letting down my kids and all that," Joy says, starting to cry. "I feel very like a failure right now. Just failing my kids." Joy's life hasn't always been this difficult. At one point, she says she ran a successful residential cleaning business in Brunswick. She had a nice car and a good credit score. But then she says she fell in love with someone who was able to hide his addiction to heroin from her. "And there was this one day I had this really, really bad toothache. My face was all puffed out. I was hurting so bad, and he offered me liquid Oxycontin and it made feel really good. Before I knew it, I was addicted to that," she says. From there, Joy says, her whole life went downhill. She has been drug-free for several years now, but she just hasn't been able to get her life back to where it once was. Joy says her older kids are angry at her for putting them in this position. Her son is supposed to start summer school. And the kids don't want to live in a shelter again, where there's a curfew, no privacy and no TV. The last time they were homeless, Joy says the shelter was her only option because she took too long trying to find a subsidized apartment and forfeited her Section 8 housing assistance. "I had asked for a 30-day extension. And it was like two weeks after I was supposed to have found an apartment that I asked for the extension. I didn't realize I only had two weeks and not 30 days, so I lost it," she says. With a Section 8 Housing Choice Voucher, low-income tenants pay no more than 30 percent of their monthly income on rent. The federal government pays the rest. But evictions, a criminal record, and a history of drug and alcohol abuse can make it more difficult to qualify. Rental units in the program must be inspected and approved by a local housing authority and the rent must be "at or below fair market value," a number calculated by HUD each year for every metro area. In his Pulitzer Prize-winning book "Evicted," sociologist Matthew Desmond writes that a housing voucher or the key to a public housing unit "can mean the difference between stable poverty and grinding poverty, between planting roots in a community and being batted from one place to another." Adam Porton, a researcher from Desmond's Eviction Lab at Princeton, says the fact is public housing is very limited, especially in big cities. "The vast majority of poor, renting families not only do not receive public housing," Porton says, "but they actually receive no public assistance for housing, including Section 8." "I think it would help to have more vouchers, yes," says James Dowling, executive director of the Lewiston Housing Authority, which owns and operates 437 rental housing units and administers the Section 8 voucher program. "In the voucher waiting list we currently have about 850 families on the list and we typically issue to applicants on the waiting list about 120 vouchers a year." But while while those 120 vouchers are being issued, more names are also added to the list. Dowling says there's also a separate waitlist for public housing, so these families have to be resourceful to keep a roof over their heads. "They may double up with other families. They may live in smaller units than they need. They may move around looking for a place," he says. "If you have a car and you can get back and forth, you might be able to live out in the countryside somewhere in a less expensive unit, but there's no easy answer." Having few housing options also forces families like Joy's to accept conditions that are less than ideal. During an interview in May, while waiting to appear in eviction court, Joy and Kyle described some of the issues they raised with their landlord. "The cockroaches were first. We noticed them but he had people spraying and it would be fine for a few days and then they'd be back. Upstairs people were like, 'Oh, have you had to deal with any mice yet?' And we're like, 'No.' And they're like, 'Oh, we just killed 27 today.' And I was like, seriously? I thought she was exaggerating," Joy says. But then she says she started noticing mice in the bathroom, running across the living room and the kitchen. "And now they're crawling on me while I'm sleeping," Joy says. "It's ridiculous. It's out of control." After getting evicted, Joy had planned to take her three kids to the emergency homeless shelter in Lewiston. But when she called she got a recorded message saying that that no beds were available for families. And then a friend in Joy's apartment complex offered to help. By letting Joy and the kids stay with her, the friend is putting herself at risk of being evicted. It's now been a week and Joy's friend is cooking them dinner. Joy chips in for groceries. The two-bedroom apartment is crowded with six people and two cats. It's hot and nerves are fraying, but Joy says she's grateful. "If I didn't have her right now, I honestly don't know what I would be doing," she says. "I would probably be going outside of a police station or somewhere and saying, 'Look, I have nowhere to go, like where can I get help?' Like I really don't know." Joy has a case manager with Common Ties Mental Health Services in Lewiston who is trying to help with housing and other needs. But Joy's life changes from day to day, and so do her options. After a falling out with her friend and neighbor who'd been putting them up, Joy and the kids headed south to Biddeford where they are now living, temporarily, with the father of Joy's kids.